Winston-Salem, NC – Sunrise Technologies, a global provider of Microsoft Dynamics ERP, CRM, and BI consulting services, announced today the release of their exclusive Retail Replenishment Solution for Microsoft Dynamics 365. 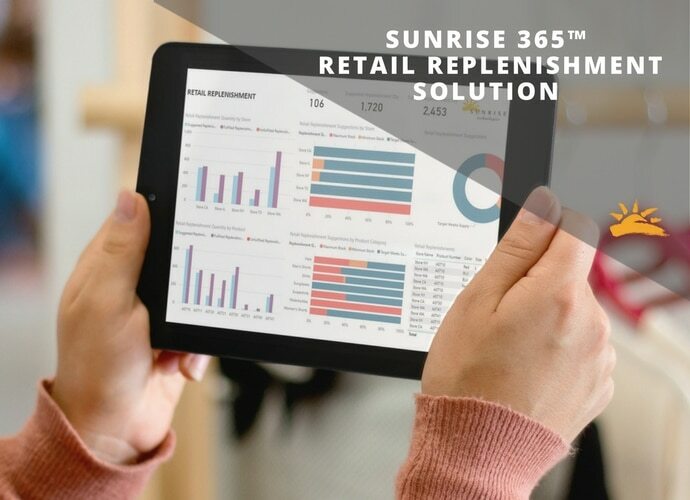 Sunrise 365™ Retail Replenishment automatically replenishes inventory for retail stores based on data within the Dynamics 365 ERP solution, with no additional integrations. Microsoft Power BI dashboards embedded throughout the solution provide key insights to users within the interface. Traditional retail replenishment tools require large amounts of data transferred to third-party software, calculated, and sent back to their backend systems. The Sunrise 365™ Retail Replenishment tool lives inside the Dynamics 365 ERP solution, dramatically reducing the time it takes to plan and execute retail replenishments. Over 2 decades of retail implementation experience combined with over 100 go-lives contributed to the creation of the Sunrise 365™ Retail Replenishment Solution. As an experienced Dynamics retail partner, Sunrise consultants have encountered many challenges surrounding retail replenishment. More information on the Sunrise 365™ Retail Replenishment Solution can be found at sunrise.co.